July 17, 2014 By Tina M 19 Comments This post may contain affiliate links. Read my disclosure policy here. You guys. My life has been changed. I have never been huge into s’mores. Mostly because it always seemed weird to me to have this perfectly melted marshmallow and then try to bite through solid chocolate. The only times I give in and make a s’more are the times that someone whips out the fudge striped cookies instead of graham crackers and Hershey’s. Well, this waffle cone version is like a million times better. And oh so genius. I had these waffle cone s’mores at a youth camp this summer, and I’m sure the idea had to have originated from Pinterest somewhere. I honestly can’t believe I hadn’t thought of this solution already. I’ve tried various ways of getting the “melted chocolate” effect into my s’more, but this puts all my attempts to shame. 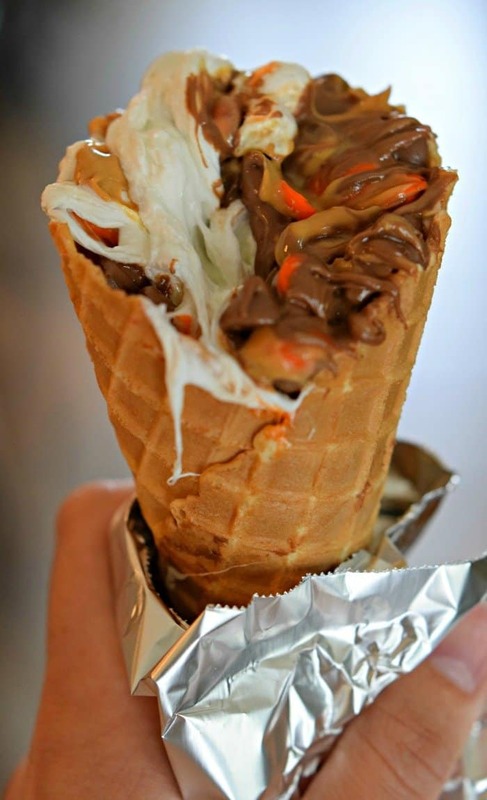 The reason this is perfect in so many ways is because the waffle cone is the perfect thickness, the chocolate is wonderfully melted right along with the marshmallows, and you can add other amazing things to it….LIKE PEANUT BUTTER CHIPS. Okay, peanut butter on a s’more? Yes please. Others: You might also love adding caramel bits or bananas or berries. 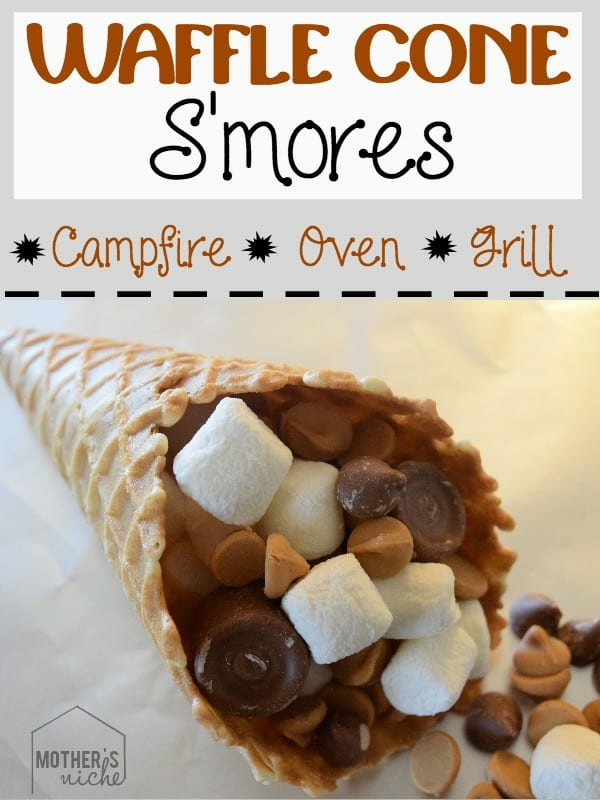 Cover your waffle cone s’mores in tin foil and place in the fire, the oven, or on the grill. For the oven, I have been placing mine in on 350 for about 8-12 min (it will vary depending on the size of cone you are using). If you really want to put your body in sugar overload, drop a scoop of ice cream on top of the melted heavenly mess. I apologize for the top pic in this photo. It’s overexposed, but I was way to excited to care. Have you had waffle cone s’mores before? What’s your favorite camping treat? What a FUN idea! Can’t wait to try this!! Seriously though, so much easier! We made these last weekend and I don’t ever think I will make normal smores ever again! I love that you put Rolos in yours – I will have to try that! Holy crap – these look AMAZING! I can’t wait to try this! Pinning!! These look amazing!! Can’t wait to try them out! At Girl Scouts camp we made smores with chocolate frosting, it was so much easier and better than biting through that chocolate bar. How do you hold them over the fire? About how long over a campfire? I made these 2 days in a row in the oven for my kids, they absolutely love them! Great idea!! Will try it camping next time. These look amazing! Don’t know if we have peanut butter chips in the UK can easily substitute with something else though. Thanks for sharing. I am going to be making these this weekend!! I can’t wait to try them! Can you wrap them in something other than foil and do them in the microwave??? You could try standing them in a glass in the microwave. I’ve never been a huge fan of s’mores either, but this caught my attention and can think of all sorts of variations. This is a great idea for the grandkids and a back to school spaghetti supper and these for dessert. Thanks for sharing. Bonfire tonight can not wait to try. Can’t wait to try these with the grandkids! That melty marshmallow and then solid chocolate is my favorite part of a smore! 🙂 These look delicious and I can’t wait to try! I can not believe that I have never thought to do this. I loooove S’mores and I love waffle cones. What a perfect combination!